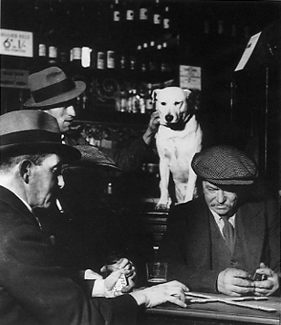 Once seen, rarely forgotten - Bill Brandt's photographs subtly take possession of our visual memory. Although - or perhaps because - he came to Britain with a Continental sensibility, this shy and complex man captured the class essence of his adopted country. In the 1930s he visited the north of England. One image, showing a miner at his evening meal, aches with dignity and exhaustion. 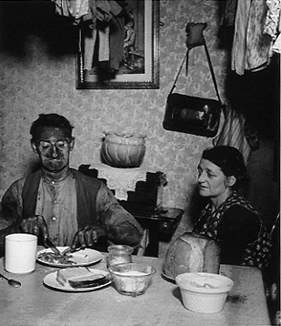 The miner, his face and fingers black with coaldust sits down to his tea, his wife looking on. Behind his shoulder is a sewing machine, carefully covered with a spotless lace doily. Above their heads clothes hang drying. 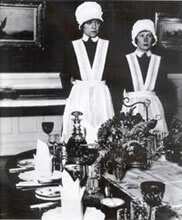 In sharp contrast is an image of parlourmaids ready to serve dinner. On the gleaming table before them are three glasses for wine and spirits with a variety of side plates. But Brandt was never content just to document social class. His view of industrial England and its workers is infused its own poetry, as in Domino Players, North London, a combination of Cezanne, Lowry and cinematic psychology. 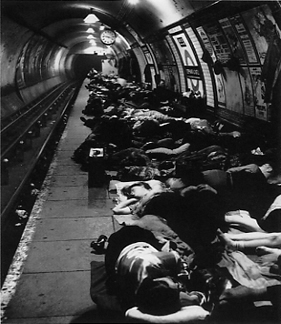 Like sculptor Henry Moore, Brandt found war-time London provided him with subjects, such as people sleeping on Tube platforms. After the war, Brandt did a series of stunning nudes using a new camera which allowed him to distort limbs in a surrealist fashion, again adding mystery and atmosphere. 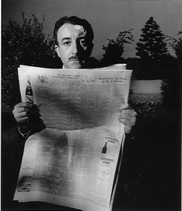 Portrait shots of Picasso, Henry Moore, Francis Bacon, Peter Sellers, Graham Greene show yet another side of the artist-photographer. Everywhere he turned his lens, poetry appears as though by magic.